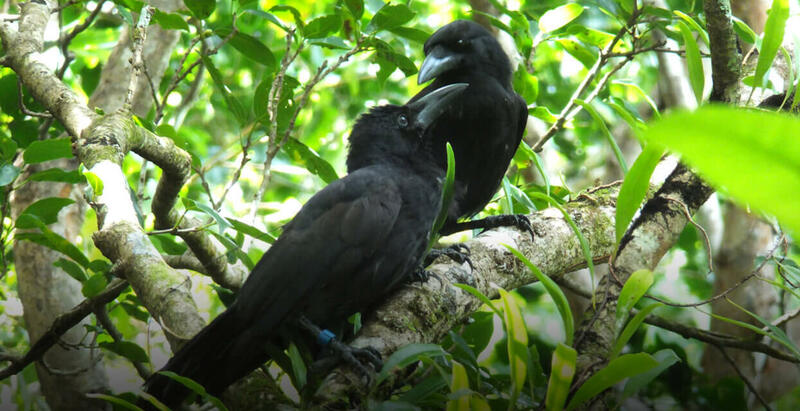 The aga, or Mariana crow, is endemic to the islands of Rota and Guam in the Mariana Islands. Extirpated from Guam by the invasive brown tree snake, the aga now survives only on the 33-square-mile island of Rota. Here the habitat remains snake-free, but the aga population, estimated at only 130 individuals, continues to decline. Nest success and survival of juvenile aga is low, but with help it may be possible to rescue the species from extinction. In the fall of 2016, our Recovery Ecology team will begin a rear-and-release project to boost reproductive success of wild aga. Eggs will be taken from a small proportion of wild nests during the beginning of the aga’s nine-month breeding season, allowing the birds time to re-nest. The first clutches of eggs will be artificially incubated and hand-reared. Captive-reared aga will then be released back into the jungles of Rota, where they can integrate with the wild population. Because the aga is a unique and important species on Rota, our team is working to engage community members in the effort. Aga use their strong bills to peck open the shells of large, terrestrial hermit crabs on the rocky forest floor. Taking the shells off of large crabs is dangerous, and young aga can take up to two years to learn the unique crab-opening techniques from their parents. Our Recovery Ecology team will be experimenting with the best methods to teach hand-reared aga these important foraging skills. In preparation for releasing larger numbers of hand-reared aga into the wild, we are working with our partners to conduct a pilot study of release techniques with two captive-reared aga that were orphaned as nestlings. Observing how these two aga forage and respond to predators in the wild will help us tailor our rearing program in the future to ensure that hand-reared aga are successful in the wild.